When we clean our bathroom, kitchen, or laundry we certainly have expectations that must be met. We expect that mold, grime, odor, and stains all be removed, right? We especially want our clothes to smell nice and fresh. Unfortunately, we are beginning to learn that commercial product producers are using harsh, toxic chemicals in order to meet our expectations. For those of us concerned with providing for the overall health of our families, this poses a serious problem! One of those products is in fact a traditional household cleaner…bleach. This may not be a surprise to you as the harmful side effects of bleach have been known to consumers for many decades. However, it remains as one of the leading poisons found in most homes. There is a more natural, safe alternative. The homemade bleach alternative. 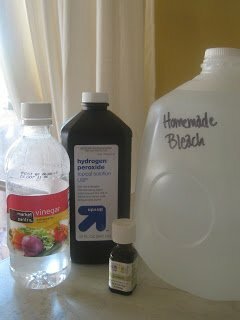 Pour hydrogen peroxide, vinegar or lemon juice, and essential oils in gallon jug. Add water to fill. Cap and store. -This is a color-safe bleach alternative. -Add a cup of homemade bleach alternative to the wash for brighter, softer clothing. -May be used in bath, tub, and toilet cleaning. -For tough-on stains soak clothing in a bucket with this solution. You may also spray on stains prior to washing. UPDATE: I humbly admit that I was unaware of the resulting product created when combining hydrogen peroxide and vinegar. In their purest and most concentrated forms, vinegar and hydrogen peroxide form a compound called Peracetic acid. Known for it’s sanitizing properties, I consider it still an excellent alternative to bleach. However, there is conflicting research regarding it’s use. 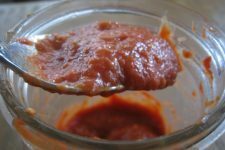 This recipe utilizes a very diluted form of Peracetic acid and our family has used it without harmful effects. Research this, learn and determine what is best for you and your family. A nice alternative to this alternative (smile) is to substitute lemon juice for the vinegar. And please feel the freedom to join in the discussion concerning this topic so we can all learn together. Please share with us all what you discover! Leave a comment letting us know your thoughts on bleach? Have you ever used a bleach alternative? What were your results? At the wound care Center, I was given Peracetic spray for redressing a wound. I used it 2 times a day for 3 months. It worked great. Just sayin……..
Can this be used on colored clothing? Peroxide can discolor clothes. I’ve had this happen to my own clothes. I would caution you to not leave it on your clothes too long as a stain lifter. I ran into trouble with overnight soaking, to give you a time frame. For a load of white clothes in the wash what is the recommended measurements? The end of this article says not to mix vinegar and HP… I thought I had head not to do this. Anybody have any info on the safety of mixing these? It has been used in the food industry since the 1950’s because of its ability to remove bacteria and fungi from fruits and vegetables. But now it is mostly used to disinfect medical supplies. I had a hard time finding things saying it was harmful. I also understand it is used to disinfect water and highly corrosive. I still would use it over traditional bleaches and cleaners. This article http://www.michaelandjudystouffer.com/judy/articles/vinegar.htm says to spray one after the other. It’s the same as mixing the two in one bottle then. It doesn’t make sense! Thanks so much for this recipe. I've been looking for an affordable bleach alternative. Does this recipe lose effectiveness if stored longer than a couple of weeks? Thanks! @Cammie Thank you for bringing this to light! I was unaware of this and after doing some brief research on this topic I have ammended the post information slightly! I am not all that concerned honestly because this is a super old recipe used for many, many decades. It is a quite diluted form of Peracetic acid (which is a weaker acid than the two on their own). And my family has used it without ill effects for a while now. It's still considered by most as an safe, effective disinfectant. Nonetheless, a nice substitution for the vinegar would be lemon juice:) I would love for this discussion to continue so that we may all continue to learn from each other and our research. Thank you again for commenting on this! I can't wait to try this! Thanks so much. This is a super awesome idea! I can't wait to try this! I love the fact that I can "bleach" and it will smell good and not be toxic! Yea . . . Excellent! My little one's cloth diapers look new! I soaked them overnight, washed, & line dried in the sun…thank you so much! I just found your blog and love it! I can't wait to try this recipe! Please stop by and visit me. I am your newest follower. LOVE this and can't wait to try it out! I have "greened" up nearly everything in my house with the exception of my occasional use of bleach. Thrilled to have found a possible alternative! Thanks for sharing! Here's another alternative: H2O2 and baking soda. You only need a little of each. I've used this for years. I just keep them separate in the laundry room and add them in the wash. 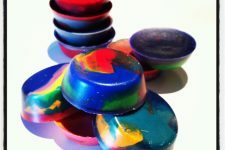 I let it agitate for a few moments then turn off the washer for about 20 minutes for really tough stains. For a regular wash I just keep letting it wash. It works best in warm or hot water. Also, if you use vinegar or lemon juice in the rinse you can sun bleach much faster. Once my Father-in-law had some clothes that had been his as a baby covered in mold. I was able to get it all completely clean and stain free again after a few washes this way. Some of it was crochet things so I had to be very careful with them. I know there’s got to be a way to preserve these gems from the past…. ideas? How much of each to be added to a full load? Regarding the concentration issue of the vinegar and H2O2, that wouldn't apply in this instance since we are adding water??? @Artemisinva Correct. At least that is the way I understand it from my reading:) It is quite diluted, yet effective! I was just thinking the other day how I'd love a recipe for this! Bleach was recommended for a grouting project we have and I don't buy it and didn't have a substitute for it – so thanks! When I would clean my tiles, I just took shoe polish in the bottle with the little tip and gently brushed over the grout. let it dry then wipe off. Test a small area first to make sure it will come off. I have never had a problem with ceramic tiles, as it always washed off. Once you get it all nice and white, get some grout sealer and brush over the grout line and you will not have to do grout again, or at least for a very very long time. I put some together today but I only had 2 liter bottle to use. Despite the different amount of water I am happy to report it works great!!! Thanks for the recipe, I'll try it out in tomorrow's wash! @Amy Good question:) It does not need to be lemon essential oil. Use anything you have on hand! I have severe chemical allergies and cannot use bleach in any form. Therefore we use a cleanser made from 2 parts vinegar, 2 parts borax, 1 part lemon juice and 1 part fine grain salt. The recipe looks something like this: 1 cup white vinegar, 1 cup borax powder, 1/2 cup lemon juice, 1/2 cup salt. Mix the vinegar and borax together first, then add the lemon juice and salt. This removes 99% of the grime, mold, mildew and stains. It doesn't do much for rust stains, though. It also makes a great sub for laundry soap when you are out. We also will use the vinegar and peroxide solution, but spray them from separate bottles to avoid creating the Peracetic Acid. I use this after preparing raw meat and for disinfecting the compost can and trash cans. I use the peroxide & vinegar srays for my kitchen, also, works great! To get rid of rust.. mix equal amounts of lemon juice and vinegar and let the item sit in it for 15 – 30 minutes. NOTE: I have not used this on clothes, but used this solution to save some very rusted tools. Soak, scrub with a old toothbrush rinse. Repeat if necessary. When they were nice and rust-free, I dried them with a towel, and put them in a low temperature oven for a while to make sure the water was dried. Then I coated the tools very lightly with a little oil — the oil differed depending on what I was cleaning. I save the vinegar/lemon juice solution in a marked jar to be re-used…never had a problem with it going bad in any way. I'm glad to see this recipe, thanks for posting it! I use homemade laundry soap and while everything smells clean, it leaves a little to be desired in removing stains. Chlorine bleach is bad for the septic tank AND it rots the fabric eventually. It's especially hard on anything that has elastic. One question though. I've been told that peroxide loses its effectiveness when stored in a container that allows in light. Would that be the case with this mixture, or would the fact that the addition of the vinegar has changed its composition be the difference? Interesting information. As a former Master Food Preserver and Food Safety Educator we used vinegar and Peroxide to sanitize cutting boards. Just keep them in separate spray bottles, and when cleaning spray one then the other till it runs off the board into the sink. Let sit for 5 minutes then finish washing board off. I will have to try this for my wash now too. I just wanted to thank you for posting this recipe for bleach. i just ran out and refused to buy chlorine bleach again, and I am so happy I found yours. I have made and used mine for cleaning and laundry. I love it! i told my mother about it and will be making her some today. Also, I hope you do not mine, but I placed this in my cleaning recipe book which I hope to pass on to my daughters some day. We use bleach in our pool instead of the chlorine tabs; anyone know if this solution would sanitize a pool? This is awesome, I am so excited to try it out! awesome ideas….I’m going to order my essential oils so I can use all of these green cleaning….I was looking for a oven cleaner also…. Make a paste with baking soda and apply to the oven…leave over night and rinse with vinegar in the morning. I have been doing indoor air quality and environmental controls at my house since 1995 when my children were poisoned by pesticides. We have had no problem using bleach (my using it, not the kids) but had loads of problems with essential oils which can be very volatile. Natural does not necessarily mean safe – do your own research such as using orange peels and the chemicals that result limonene (if I recall correctly). Just wanted you all to beware and not assume natural is always safe – some aren’t – do your research. Check out Melaleua.com. Been using their cleaners and laundry supplies as well as personal care ptoducts for 11 years and would never go back!! How much do you use of this solution for a large load of clothes? I read some where ( can’t remember exactly) that peroxide breaks down when its not in its original container. Im guessing that’s why its always in a brown bottle. Will that have an effect on this solution? I would think that the fact that this product also sanitizes is a plus. I’ll definitely be making this recipe. Do you use food grade peroxide or the stuff that has all the chemicals in it? Just curious. I use the lemon juice.Smells great & works even greater. It helps sanitize my scrubs. This may be a silly question but….will using the lemon juice in the recipe cause any stains on white clothes? No silly questions here 🙂 Lemon juice acts as a brightener. I’ve never had a problem with it staining clothes…it actually removes stains very well. Great question Haley! I’m sure you’re not the only one wondering! i can understand the concerns for using lemon juice instead of HP, but in my case im allergic to anything lemon. i get terrible migraines after consuming it, or smelling it. i cant even use lemon smelling cleaners like Pledge. are there possibly anything else i could substitute besides vinegar and lemon, or is that it?? Since there aren’t any silly questions here and we are kind of new at this, when you mention “pure water” in the recipe, does that mean tap water is OK or would you need something like distilled water? Thanks! I had a friend who worked at the summerland ag research station who said… they did a study and found that 99% of bacteria are killed with dish washing detergent and scrubbing! this agrees with the info I received from the health dept. (kitchen inspection) public facility. The rubbing breaks up the growing bacterial colonies thereby reducing exponential growth. strong oxidents like hydrogen peroxide not required. I have cleaned with bleach for over 30 years being a housekeeper. Three years ago I developed breathing problems. Dr says I can’t do that work anymore. Harsh chemicals make me Ill now. My shower wall is embarrassing. I will try this, seems I tried everything else. Hi – I am wondering too about the pure water – what does that mean? Sorry if I missed the answer, I see someone else asked it too, but didn’t notice a reply. Thanks so much!! Can’t wait to try this, although I’m not sure if I should use distilled water or just tap water or we have reverse osmosis filtered water I’m wondering if I should use that. ? Thanks again for the awesome information! I have seen other cleaners which use hydrogen peroxide as an ingredient. Do you have to use the entire batch at once or does the hydrogen peroxide remain active if the batch remains tightly capped between uses. Is there a powdered version of the Homemade Bleach Alternative that I can mix right into the dry handmade powder laundry detergent when I make it? Will it ruin my dark/colored clothes? I think that it would be possible to aquire similar results using powdered oxygen like the ones they advertise on T.V. and citric acid. Those powdered oxygen products are supposedly pry peroxide, from what I understand. I do know very little about them but my grandmother bought one once and didn’t like it, as she is a huge fan of chlorine (bleck!). She gave it to me and I used it up, finishing it about the same time that I happened upon this recipe – how con venient as I am alergic to chlorine! 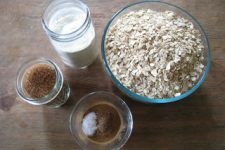 I love this recipe and even add a few drops of tea tree oil to the jug to ramp up the disinfecting qulities! Except that bleach isn’t a specific chemical – http://en.wikipedia.org/wiki/Bleach – note the hydrogen peroxide that your recipe uses is in fact one of the chemicals that is sometimes used as bleach! I just use a vinegar and water solution for everything instead of bleach. I usually use a 1:1 ratio. I was told that is is just as effective to cleaning as using bleach in my Registered Nursing classes. My family uses straight white vinegar in a spray bottle for cleaning. For the really nasty messes (like where you would use bleach) I also have a spray bottle of hydrogen peroxide. Spray one, then the other. Let sit a few minutes. Wipe clean. No mixing chemicals. Same result. I have been using these separately for several years. HP in one bottle and an orange vinegar in another spraybottle. Use the vinegar on any surface , wipe down, then spray with the HP. Kills 100% of germs on the counters and sinks in the kitchen. Great stuff. I would love to try this in my laundry instead of regular chlorine bleach… it would certainly smell better. Andrea, thank you so much for this information! I know you posted it long ago, but I just now found it. Very timely for me. Thank you for this contribution! I can not wait to try it, I have my mix ready! I am wondering though, do I add it to the part where I would normally add the bleach or do I just add it to the cloths at the beginning of the cycle? Thank you for your time! Apple cider vinegar can stain so it would depend on where you were using it. I have another recipe I’ve been using that works great! Hot or warm water, 1/2 cup washing soda, 1/2 cup of HP. I use more depending on the amount of clothes. Can add regular laundry soap as well. Let agitate, then let soak for awhile. I usually let it soak for an hour or more. Then let it finish the cycle. I love this! Maybe I will try HP and lemon juice. Thanks! Hi, thanks for this – I’ve talked about this page and provided a link to it on our blog about sustainability. I use the hydrogen peroxide (1/2 c) and lemon juice (1/4 c) in my whites and love it vs. bleach. We have lots of respiratory problems in the family and it’s one less thing I have to worry about! I use the same recipe with great success. The big test is if the formula will clean Connor’s dirty lacrosse socks. If you have an athlete in the house, you know what I mean. I find that a pre-soak in bleach is necessary to get those socks back from gray to white again. Thanks for this great inforamation!!! Wow, didnt even realize it was you who posted it on facebook….that oldstimer thing kicking in I guess! Im so excited that I found you! There are other cleaners you can make with essential oils and you are helping the environment and your families in doing so. Below are some of my favorite recipes. Most of these ingredients can be found in your grocery store. A few might need a visit to Amazon or other internet retailer. Start up cost to get these ingredients might seem overwhelming. But, the cost per use remains significantly less than retail cleaners. They last a LONG time and you can use them in many ways around your home. Also, it’s a good idea to ditch the paper towell use as much as possible. Try microfiber clothes for cleaning. They are great! Choose a container big enough to accomidate the chemical reaction of the Baking Soda and Vinegar. Combine ingredients starting with water, essential oils, and baking soda. Add vinegar slowing to avoid volcano effect. Add all ingredients into a glass spray bottle. Shake before using. I get my glass containers and spray bottles at AromaTools. Doing Day Care and then graduating into Homehealth Care for 28 years I have seen a lot of blood stains ! one day I noticed that by pouring Hydrogen Peroxide on a a bloody cut it bubbled the blood away, so I poured some on my shirt and sure enough it took the blood stains out. i felt like “a god” it was so amazing.! Now that I am retired I find out people have been using it forever. Sure did burst my bubble ! this is the first time on your page and I have found so many references I have been on here all afternoon ! Thank you for posting so much info. My grandparents were Amish and my dad spoke often of Home Remedies, some that sound like what I have been reading. I’m in my 70’s now and am going to print alot of these out for my grandchildren ! Bless you all for being so good to the inviroment. So, in reading thru – i am unsure here – is the essential oil necessary? or is it just for the smell? would like to not have to buy it – and really, the smell from the eo would linger, whereas the ones from the vinegar and hp would dissipate fast….help! Fascinating – and lots of interesting points and recipes in the comments too. I’ve used vinegar and h2o2 in separate spray bottles for all sorts of cleaning and disinfecting for years – ever since reading about Susan Smner’s 1997 test results at the Virginia Polytechnical Institute on e-coli and salmonella. In her tests she used a white vinegar at full strength and a 3% hydrogen peroxide in separate spray bottles on wood cutting boards and other surfaces which she contaminated with the bacteria. She found a 99.7% success rate in bacteracidal effect on both when mixing the sprays, one after the other, in either order. The highest effective rate she tested. I had never heard of mixing the two together even through I’ve been using and researching hydrogen peroxide for years. Fascinating! I did not read all the posts so someone may have already said this…..When you combine vinegar and hydrogen peroxide peracedic acid does form. The thing is vinegar is acetic acid which is a stronger acid then peracedic acid, lemon juice is a pretty strong acid as well….this is what makes them good cleaners. Just because something has the word acid in them you do not need to be worried, they are both fairly harmless compared to something like sulfuric acid. Bleach is a very strong base and much more harmful then both vinegar and peracidic acid. We have an older house with pipes that have never been updated. Replacing the old pipes is on our to-do list, but is super expensive, so in the meantime to prevent clogging we use bleach once a month in all of our drains. My husband and MIL swear by it, but I really would like to be able to keep it out of our house. Do you know if this homemade bleach would work just as well in our pipes? Or is there another homemade solution we could use to combat clogs? This is great! I bought a bottle of enviromentaly friendly bleach altern. and payed way to much only to find out that the ingredients are hydrogen peroxid, citric acid, and water…making my own now, but after reading your amounts I think I’m making it to strong. Maybe I’ll try the lemon juice. Thanks for sharing your info. I’ve used baking soda and apple cider vinegar in my pipes for years; used to live in a 100+ year old house. Use 1/2 cup baking soda and 1/2 cup cider vinegar (add the vinegar slowly as it will foam). I always do this at night and let it work overnight. Follow with hot water. I’ve rarely had to use a drain cleaner. Just this morning I woke up thinking of an alternative to bleach in cleaning my bathroom and I come up with your post. Definitely going to try this. Thanks! All my children have recently beel very ill. Seems like they are just passing it back and forth! I use this on my laundry all the time bur can I use it luke lysol to spray on furniture un washible bedding ect…. I am a preschool teacher and we need an alternative to bleach..if you use this on toys do you need to wipe it off or wait any time before giving it to the kids again? Can this be used to clean floors? If yes does it have to be diluted more? Thank you for writing “Homemade Bleach Alternative”. I’ve never understood why people bother mixing Hydrogen peroxide and vinegar. Vinegar is an acid while hydrogen peroxide is a base (along with baking soda used in other recipies). All you are doing is making whichever one is stronger weaker. This is taught in every basic chemistry and biology class. I have a bachelors in biology and a minor in chemistry. The idea of mixing these two has always sounded ridiculous to me. To get the full strength of both you should use one after the other, not at the same time. I am all for recipes that are better for the environment but sometimes people need to think about what they’re mixing. Many thanks for posting “Homemade Bleach Alternative”. great deal more reading through and commenting here soon. how do you feel about oxygen bleach. i love biokleen it’s great for color and whites. Can you use this on your hair? I’m dying my hair and its really dark,I don’t want to use regular bleach because it can damage my hair,so would this work to make it lighter ? Just double-checking, is it okay to use bottled lemon juice? Also, would adding baking soda to the wash along with this mixture be safe? I already do a mix of baking soda and vinegar, for deodorizing but this mix has the added benefit of brightening/cleaning! Thanks in advance and for the great tip!!! I’m loving the green cleaning idea but the smell of vinegar just takes me over the edge. I’ve tried using it for cleaning (many times) and can’t seem to get past that smell, ewww. It lingers. Maybe my nose is too sensitive. However, I’m using Hydrogen Perioxide mixed with lemon juice in a spray bottle with water. I am wondering, though, if I need to keep the spray bottle in the fridge so the lemon juice doesn’t turn rancid? Thank you for any info on this. When you say spray one after the other, do you mean spray one and wipe it off, then spray the other and wipe it off? Do you let it sit for a while before using the other? Is this safe to use to disinfect my toddlers toys??? Can’t wait to try this bleach alternative…no more bleach for me! Is it possible to use lavender oil instead? Thanks! Lavender also has anti-viral and antiseptic properties so it would be fine to use. Lemon has greater cleaning properties than the lavender adding anti-microbial and being a bactericidal. I am just wandering can this recipe be used for cloth diaper stubborn stain? Will it damage the PUL on the cloth diaper cover? and damage the fabric? microfleece fabric. How much would you use for small and large loads? I want to use on my cloth diapers. The vinegar & peroxide combo worked greaty for me!